Don't be late, escape the Lower 48! Summer heatwaves are just around the corner, but you can stay cool this summer, Alaska style...book your Kenai River getaway today!! Reserve Online Now! 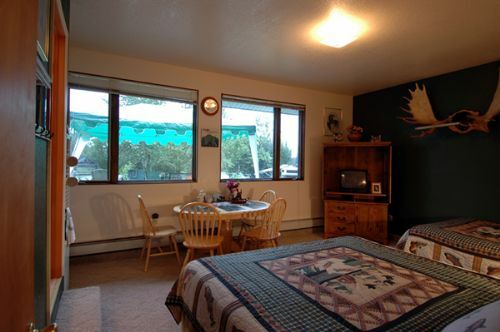 or Call us today at 907-262-1717 for availability & rates! Make It Come True in 2019! Alaska Dreams are our Speciality! Check out our Alaska DreamTrips and Call us today at 907-262-1717 to share your Alaska Dream! We're spoiled on salmon in Alaska. The Kenai River is blessed with 4 species of salmon in 7 different runs, with nearly 2 MILLION salmon coming home to the Kenai every year...Get the Facts and Call us today at 907-262-1717 to time your trip right! Realize YOUR Alaska Dream by harnessing our local expertise! Book now on our website or Call 907-262-1717 and make your family's 2019 Alaska Dream vacation a reality! In our spacious, first-class lodging! Book our Riverfront House or Suite today! 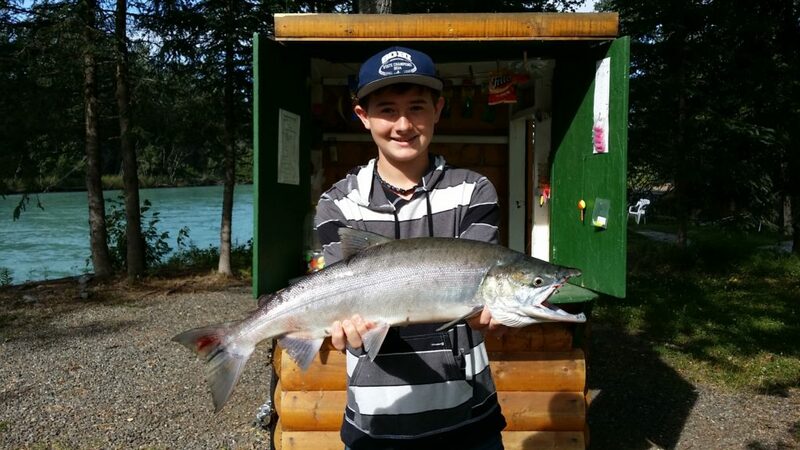 Call 907-262-1717 for help planning your family's Alaska fishing vacation! Book peak salmon season now! Don't get stuck camping in the Walmart or Fred Meyer parking lot this salmon season! Visit our website or call 907-262-1717 for a real Alaska camping & fishing experience! Make YOUR Alaska Dream a reality this year, creating unforgettable memories for your family! Call us today @ 907-262-1717 to help make YOUR Alaska Dream come true! Experience the Alaska of Your Dreams! EVERYONE dreams of Alaska…and you’ve been promising your family that Alaska trip long enough. We want to help your family’s Alaska Dream become a reality this year – in any season – in any way your dream is imagined! For many Alaska visitors, it’s all about the fishing. If that’s you, the Kenai River is exactly what you’ve been dreaming about! With nearly 2 million wild Alaska salmon, 4 different species, arriving in multiple runs, as well as trophy rainbow trout & dolly varden, you can’t help but get addicted to fishing on the Alaska’s Kenai River! But save some energy for all the other great summer Alaska adventures like Alaska Bear Viewing, Kenai Fjords Glacier Cruises & Whale Watching, Alpine Hiking, Blueberry Picking, Flight Seeing, The Alaska Railroad Denali Trips, Photography, Sea Kayaking, Whitewater Rafting, and so much more! Alaska offers adventure for everyone and we can help you with YOUR Alaska Dream in any season! From dog sledding & snowmobiling Alaska in winter, to aurora borealis chasing & skiing Alaska in spring, to big game hunting & photography expeditions Alaska in fall – We’re here to dream big with you and make it happen! Simply Request a Reservation to check availability or reserve your Alaska Dream today! Alaska’s BEST Choice for Family Fishing! IMAGINE your family fishing in the land of the midnight sun, your kids catching their first wild Alaskan salmon, native rainbow trout and beautiful dolly varden, all while bald eagles soar overhead and moose wander by….pure nature at it’s best, unspoiled, untamed. It’s all here in Alaska–waiting for your family to experience, enjoy and savor! Alaska is one of the world’s most affordable, safe, and pristine family travel destinations–and we’re more than just a resort on a beautiful river–our family is here to help you plan every part of your Alaska Dream trip! Simply Request a Reservation to check availability and secure your preferred dates quickly and easily online today! You can also Call us at: 1-907-262-1717 to chat about your trip anytime. Staying on the Kenai River is an experience in itself, but location location location is so vitally important to a GREAT Kenai River experience. Our 2 acre riverfront paradise offers the ideal bank height for Red Salmon (sockeye) and Silver Salmon (coho) fishing, with perfect water conditions for both. We’re also ideally located just 17 miles from the ocean (4 river miles downstream of the Soldotna bridge) giving our guests access to fresh-from-the-ocean salmon that are of the highest possible quality! We’re also right in the heart of the best King Salmon (chinook) fishing on the Lower Kenai River…literally right at our river doorstep, where the 20 hottest King Salmon fishing hotspots are either within sight (Sunken Island, Poacher’s Cove, Harry Gaines Quarter Mile, Slide Hole, Airplane, Big Eddy) or just a short boat ride down river (Stewart’s, Falling In Hole, The Pillars, Eagle Rock, Beaver Creek, Mud Island, The Pasture and more). The peacefulness of waking each morning to the sounds of bald eagles calling each other, salmon splashing as they prepare to spawn upriver, and the therapeutic hum of fishermen casting their lines into the beautiful turquoise waters of the Kenai is truly paradise for those who love the great outdoors. These are sights & sounds reserved for you as well when you stay with us on the Kenai River and KIDS ALWAYS STAY FREE at Kenai Riverfront Resort! While the conveniences of town aren’t far away, you’d never know it from the peace & tranquility you feel here on the river. Don’t be lured into staying at a discount place off the river, where the only sights you’ll see are traffic, run down properties with junk piles, crowded public fishing areas and pesky mosquitos. Stay on the Kenai River and experience the Alaska you’ve been dreaming of! Simply Request a Reservation to check availability and secure your preferred dates quickly and easily online today! Stay on the Kenai River in our Riverfront Suite and enjoy deluxe riverfront accommodations, with a stunning view of the Kenai River, as well as unsurpassed shore fishing! Showcasing authentic Alaska in decor and ambience, you’ll relax in privacy and comfort in our suite featuring two premium queen beds, private bathroom, sauna, and all the comforts of home. Request a Reservation to check availability today! 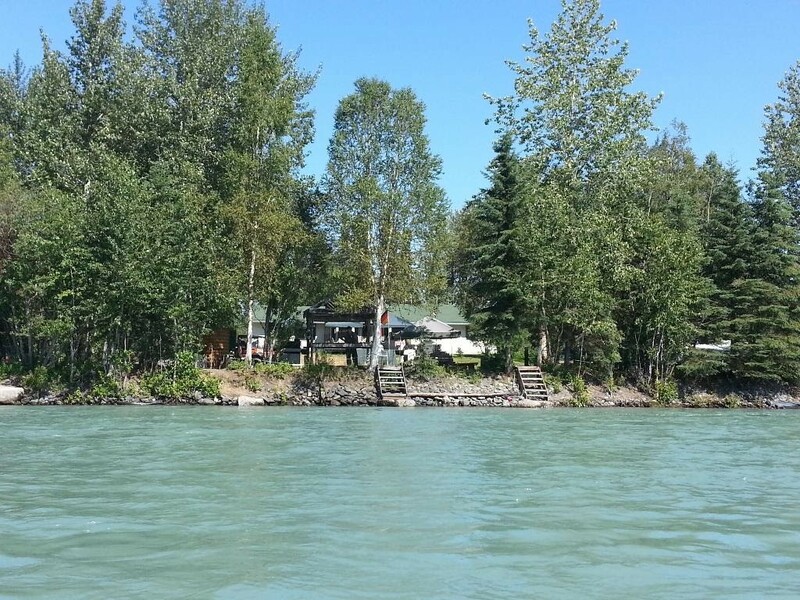 Kenai Riverfront RV Resort is your best choice for a stay on the world famous Kenai River! 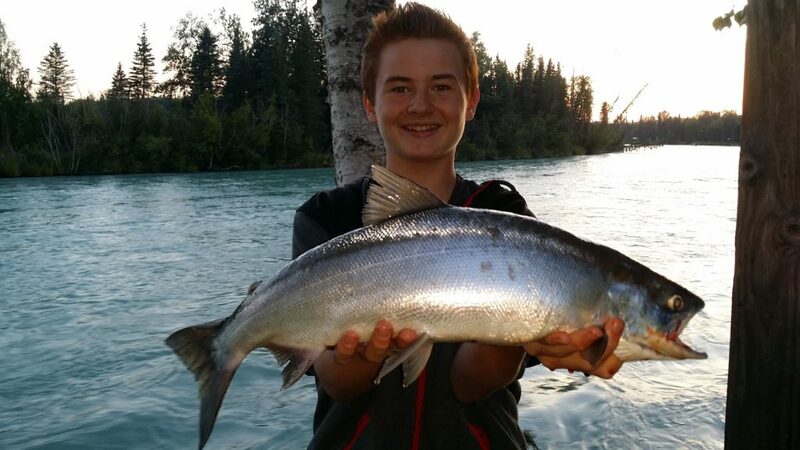 Many of our guests return every summer after staying with us on their first visit to Soldotna and the Kenai Peninsula because they know they’ll be hard-pressed to find a better bank for fishing the feisty Sockeye Salmon that the Kenai is famous for. Peak season fills fast, so Request a Reservation to check availability today! 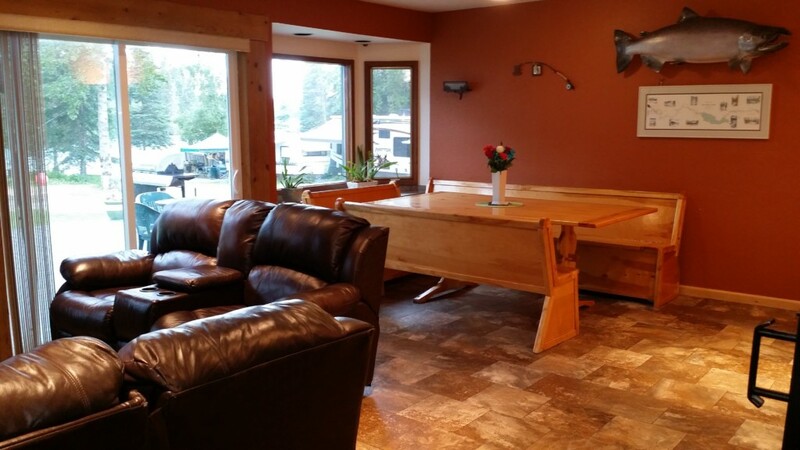 The recently remodeled Kenai Riverfront House is a truly 1st class, turn-key vacation rental here at our unsurpassed location on the lower Kenai River–with lodging for up to 8 adults or a mix of adults and children up to 12 with everything you need for an unforgettable, private Kenai River family fishing vacation experience! Peak availability goes fast so plan well in advance and Request a Reservation to check availability today! Kenai Riverfront Resort’s location can’t be beat! 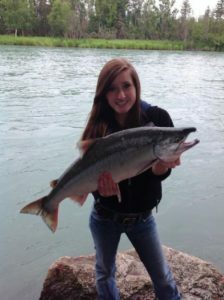 Kenai Riverfront Resort is located just minutes from downtown Soldotna, Alaska on the world famous Kenai River, offering unbeatable fishing on the lower Kenai River–North America’s #1 fishing hotspot for trophy King Salmon, Red Salmon, Silver Salmon, Pink Salmon, and Rainbow Trout. 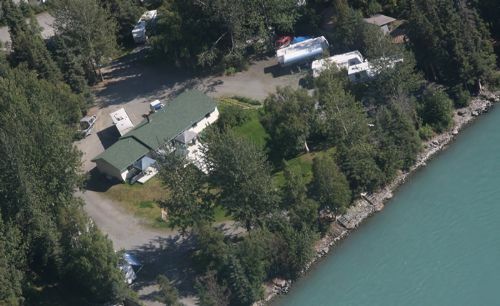 We’ve been Kenai Riverfront RV campers for 12 years and we think it is undoubtedly one of the best RV resorts on the Kenai River. The red fishing is awesome and you’re within easy access by boat to the best king holes. This resort is also convenient to local services. Jim, Cindy & their kids have made this a wonderful family oriented resort from sing-alongs around the campfire to international volley ball games and special occasion pot-luck fish fries. 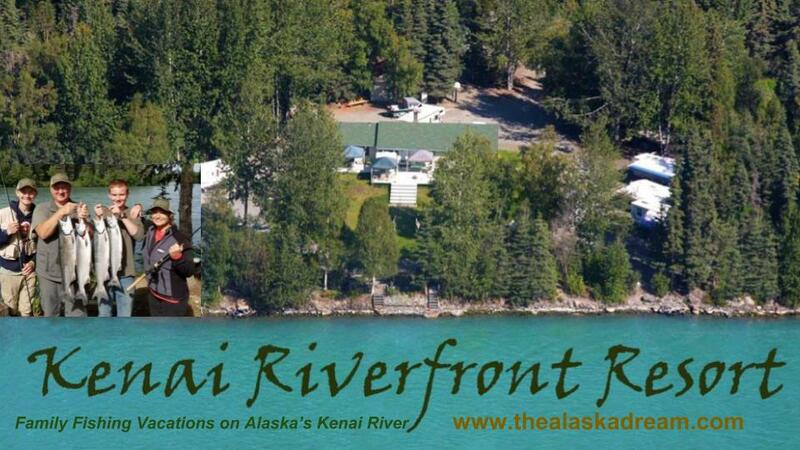 Kenai Riverfront Resort is truly enjoyable! We ended up at Kenai Riverfront by pure accident…but boy were we lucky! It’s a gorgeous property with soft grass you can actually walk barefoot through and trees and lots of space to relax or fish. This IS NOT gravel parking lot camping. Coming from Texas where our RV parks are usually dense with trees and some grass I was shocked to discover most of the private Kenai peninsula “RV parks” are just gravel lots with rvs crammed in them as close together as possible. Kenai Riverfront is the OPPOSITE of that concept. Only 15 spots with plenty of room between you and your neighbor! This is camping “Texas style”. We could grill our salmon that we caught that day and have plenty of room to do so right beside the trailer. There’s a volleyball net set up and any camper that wants to join in can. There’s plenty of River space to fish. You are NOT shoulder to shoulder with other fishermen! There’s a fish cleaning station, a tackle shop where you can rent gear and buy hand tied flys. And when you’re sore like I was from marathon salmon fishing you can enjoy the FREE double head shower and COMPLIMENTARY SAUNA! It soothed my aching back! The service from the property owners goes above and beyond! There’s a campfire ring that sits riverside and guests can enjoy nightly campfires and sometimes even sing alongs. It’s what family camping used to be! We had a great time, with our group being my husband, myself, two teens and a toddler. (They even provided my toddler with a free loaner life vest!). I could go on and on and on…. We arrived at Kenai Riverfront by chance and luck knowing zero about salmon fishing in Alaska. With their teaching (they’ll help whomever wants it while they stay!) we left knowing about what to use, how to fish correctly to catch the salmon and how to actually land them too! We are leaving with a cooler full of salmon to put on the plane! Thanks for a great River experience. -One more thing…. Somehow they make every guest feel like a long lost friend. I don’t know how they do it, but it’s genuine. You will NOT go wrong staying at Kenai Riverfront! I was put in charge of planning my family’s RV trip through the Kenai Peninsula and thanks to the Kenai Riverfront Resort and its amazing owners, I did a fantastic job! 🙂 The resort was absolutely wonderful and even after reading all their great reviews, it STILL exceeded my expectations. The Kenai River was just a few steps from our RV with the salmon swimming right along the shore. It’s a gorgeous area with tall mature trees for shade and comes with plenty of amenities, not to mention a grocery store nearby. This place is amazing on its own but what truly made it magical was the family who ran it. Jim, Cindy and their two boys, CJ and TJ, really made this place feel like home. They gave us a full tour when we arrived and gave my mother and I some fishing lessons. TJ and CJ run the tackle shop where they make handmade flies that I’m pretty sure sealed the deal on the fish my mom and I caught. They taught us how to fillet and butterfly the salmon and even came by with spices and tips on how to cook it over the fire. It was without a doubt, the best salmon any of us have ever had. Jim and his family went above and beyond for us and we feel we have made lifelong friends. We already miss the dips in the river, music around the fire, their kindness and we cannot wait to come visit again. If you are unsure if this is where you want to be, please take my advice- you do not want to miss the opportunity to stay here! On a family RV trip through Alaska we stumbled upon the Kenai Riverfront Resort and fell in love with the natural beauty of this hidden gem! It has something for everyone, from fishing on the Kenai to biking down a lovely country road to feed the neighbor horses…and the best part of our time there…a good old fashioned Kid vs Adults volleyball game! The sauna on site really came in handy after that! Our entire family agrees this is the blue ribbon winner for places to visit! Many thanks to the Nelson family for making our trip memorable. Can’t wait to come back and see the “Snack & Tack” in action!